Your visit to the Garden begins with completing a field trip request form. Please register your field trip and someone from the education team will be in touch shortly. Please identify a field trip lead. Group leads are responsible for arriving ten minutes before scheduled activities. Group leads should report to the front desk of the main Conservatory building at 100 Maryland Ave. SW for check-in. After check-in, group leaders should follow directions provided by front desk staff. Groups are to remain together until greeted by our education team. 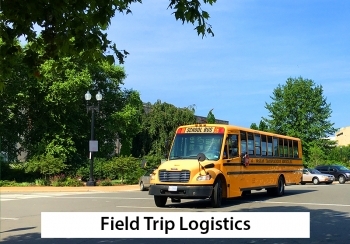 Groups participating in a field trip experience arriving 30 minutes or more past their scheduled time cannot be guaranteed a lesson. Please call (202) 225-8333 to let us know if you are running late or if there are any unforeseen circumstances. Teachers and chaperones are responsible for ensuring the group's appropriate behavior throughout the entire visit. Students must be accompanied by an adult at all times. We recommend you break into small groups, with one adult per every six to eight students. Please have your students stay on the paths at all times. This is true in our Conservatory and while visiting our outdoor gardens. Please stagger your visits to the restrooms to avoid overcrowding. Groups are not permitted to eat in the Conservatory. Storage space for lunches is not available. Your group is welcome to eat in our outdoor garden spaces. If eating in these spaces, please bring trash bags to "pack-out" your waste. Please remember that our outdoor gardens are part of our museum. Please remind students to remain on the paths at all times. The U.S. Botanic Garden strives to makes its facilities and programming accessible to all visitors to ensure a successful museum visit. Our Accessibility Page provides more information. The easiest way to reach us by Metrorail is by taking either the Orange, Blue, or Silver line to the Federal Center SW station. Exit the station, walk north (left) along Third Street SW for two blocks, cross Independence Avenue, and continue one more block to Maryland Ave. Look toward the Capitol and you will see the glass dome of the Conservatory. The Cosnervatory entrance is on Maryland Avenue. Metrobuses #32, 34, and 36 stop behind the Conservatory at Independence Ave and First Street SW. We encourage taking public transportation; you can plan your trip on Metro. Metered street parking spaces are available within a few blocks of the U.S. Botanic Garden. A limited number of accessible spaces are available in front of the Conservatory on Maryland Ave SW. The Garden is open daily from 10 am - 5 pm. Admission is FREE.